In most photos, he hides his face behind his hair. 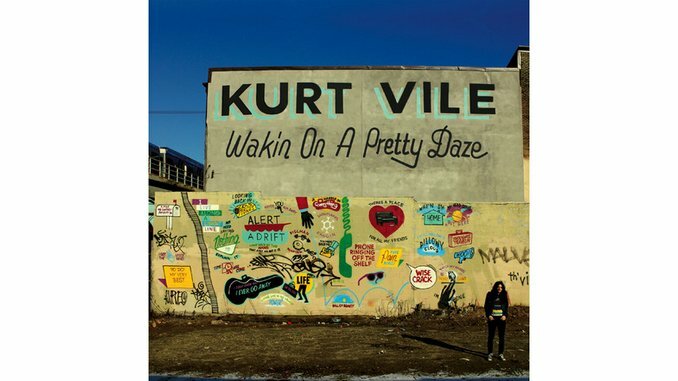 Long, dark, nappy in the summer months—Kurt Vile’s wavy strands fall like drapes over the edge of his microphone. His beady eyes rarely catch a square gaze with a camera lens, an audience member or an interviewer. Through most of his career, Vile’s voice, too, was but one element of a multi-layered mix; masked. So, when Vile sings his first line some 40 seconds into the first song on his new record, Wakin On A Pretty Daze, and when those lyrics are as clear and bright and crisp as the dawn that he describes, you know something is intrinsically different about this album. While his early releases, namely 2008’s Constant Hitmaker and 2009’s Childish Prodigy, were more a collage of loose ideas organized around a singular, murky sound, Daze presents 11 carefully composed tracks with beginnings, middles and ends. Themes of movement and escape are the bedrock of this album. Vile’s dreamlike crooning on “Girl Called Alex” precedes the punchy, more direct sentiment of “Never Run Away.” With its multiple breakdowns, songs like “Pure Pain” recall the better moments of Crosby, Stills, Nash and & Young’s “Déjà Vu,” among other cornerstones of the Laurel Canyon scene of the 1960s and ‘70s. Subtle pedal steel swells are a welcomed addition to the live mix, more atmospheric than country or kitschy. “There is but one true love within my heart,” he tells us on “Snowflakes Are Dancing.” It’s a continuation of a theme from Smoke Ring, wherein Vile proclaimed, “There is but one true love in my baby’s arms.” There’s a calming balance to this record—lyrically, thematically, sonically. It closes exactly as it begins, with a long, winding, peaceful melody—one of the prettiest Vile has ever penned. “In the night when all hibernate, I stay awake, searching the deep, dark depths of my soul,” he says. He describes his process of finding that one moment, the “golden” tone. It’s a beautiful song about—what else—the nature of writing a beautiful song. Things are different now. His voice is in the foreground. His eyes meet the camera in the press photo. He’s alert, aware. Awake.